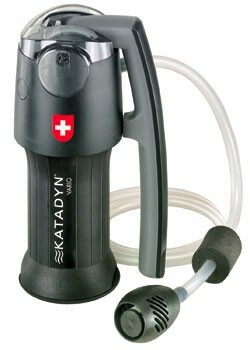 The newest Katadyn Water Filter, the Vario is the first water filter that is adjustable for different water conditions. The Vario combines the two leading water filtering technologies, ceramic filter and pleated glassfiber filter, and allows you to select the filtering mode to best suit the water you're treating. In the "longer life" mode, water passes through all three filter elements, i.e. pleated glass fibre, ceramic and charcoal cores, at flow rate of 1 liter per minute. 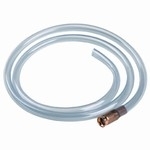 The longer life mode extends the life of the filter elements, but reduces the flow rate. However, using all the elemets including the ceramic allows you to effectively filter water with more difficult conditions such as cloudy water with solids content. The ceramic traps silt and particles and can be cleaned periodically to remove the trappped solids. In the " Faster Flow" mode, the ceramic filter element is bypassed, allowing filtration by the pleated fiber element at a faster flow rate of 2 liters per minute. In both modes, the water passes through the Carbon Core, which removes chemicals and addresses taste and odor issues. All three filter elements are replaceable and may be ordered seperately. Lightweight, compact and portable the Vario is the most feature rich portable water filter available today. Ideal for camping, backpacking, or as critical personal emergency preparedness equipment.